94th N Maple Athlete Payton Rice sat in with former NBA Referee and Associate Vice President of Referee Development George Toliver. George on behalf of the NBA held a Referees clinic to learn what it’s like on the other side of the whistle. 94th 12u Boys Wins 2nd place in the Long Island Nets 3on3 tournament! Saturday August 25, the 12U team came in 2nd place in the 2018 Long Island Nets 3on3 tournament at Nassau Coliseum! Director Amaree Taylor meets with Brooklyn Nets Head Coach Kenny Atkinson! Academy Director Demetrius “Amaree” Taylor met with Coach Atkinson of the Brooklyn Nets this past weekend. 12U AAU ROSTER SET TO PLAY! 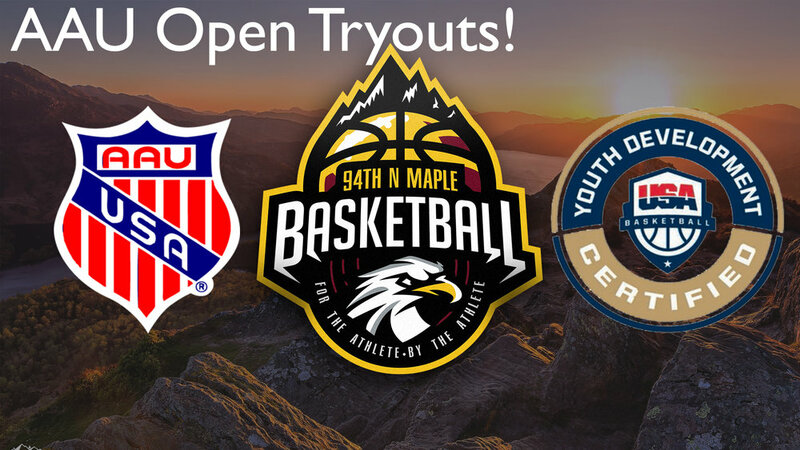 The 94th N Maple Basketball Academy will be having open tryouts for 8th grade (or lower) boys that will participate in The USA Basketball 2018 U.S. Open Basketball Championships. Click for details. AAU Season is almost Here! The 94th N Maple AAU Basketball Club will be having tryouts for 12U boys that will participate in AAU certified tournaments throughout the Spring/Summer 2018. Click for details. 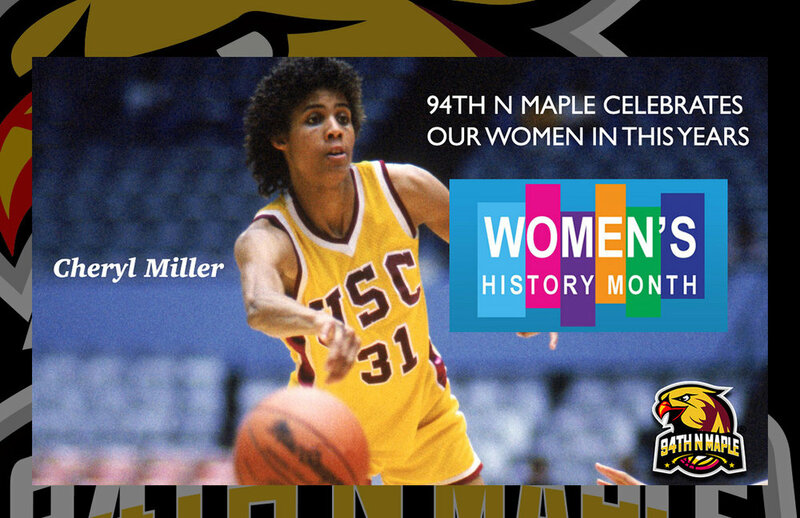 One of the most decorated high school and collegiate women's basketball players in history, Cheryl Miller helped her Riverside Poly High School team post a four-year record of 132-4, notch an 84-game winning streak, and win four straight CIF-Southern Section championships. She also Scored 105 points in a single game! 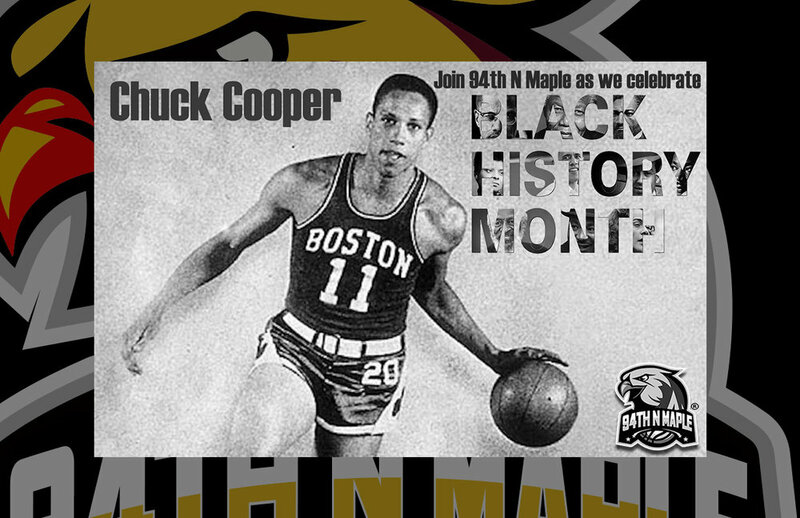 Cooper was the first black player taken in the NBA Draft, after being chosen 13th overall by the Boston Celtics in 1950.Playing for legendary coach Red Auerbach, Cooper and future Hall-of-Famer Bob Cousy helped bring the Celtics back from their early years’ mediocrity. For four seasons, Cooper served as a reliable piece for the Celtics, averaging 6.8 points and 6.6 rebounds per game. Tip off to the Winter Academy! The 94th N Maple Basketball Academy and the St.Dominic Elementary School teamed up this Veterans Day. Over 100 students donated a pair of socks to the Wounded Warrior Project where their mission is to Honor and Empower Wounded Warriors that served for the United states of America. 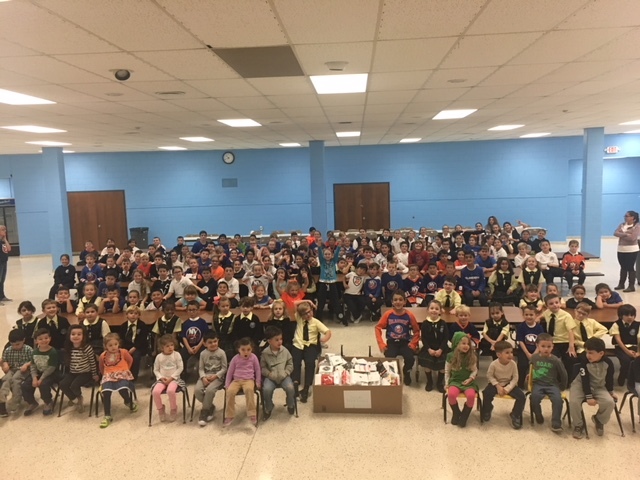 Michelle Kurowski a 4th grade teacher at St. Dominic Elementary School coordinated the entire event where additional cards were made by the students and attached to each pair of socks illustrating what it means to be a warrior. October is Breast Cancer Awareness Month. Our 94th mission is to help increase awareness of the disease. For more information please visit your Breast Cancer Awareness Centers and/or websites. There are a number of ways to support those affected by breast cancer. Whether helping the community as a whole or donating in honor of or in memory of a loved one, each donation helps sustain our mission to educate the community and fight to end breast cancer. The 94th N Maple staff assisted in the 2017-2018 Long Island Nets Open Tryouts . 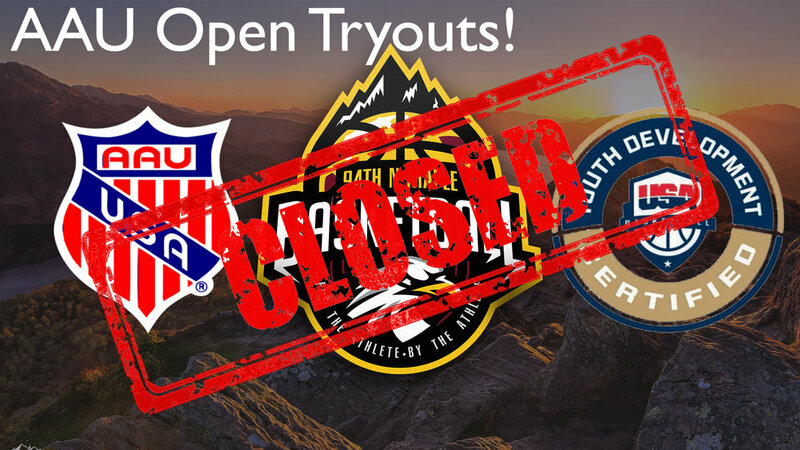 115 Participants looked to land a roster spot for the upcoming training camp. Summer sweep of Long Island is winding down! 94th N Maple Coach Khalil McDonald to Premier on VICELAND! 94th N Maple athlete and Moore Catholic student/athlete Hasan Ringer recently signed a national letter of intent to attend Queens College on a full athletic scholarship. The 17-year-old Ringer, a recent Moore Catholic High-School graduate, was named the 2017 MVP of The Annual Staten Island Senior All-Star game where he scored a game high 33 points. New York Knick Legend Latrell Sprewell in the HOUSE! Sprewell was apart of the Iconic New York Knick 98'-99' roster. Latrell stopped in and dropped some jewels for the youth to utilized in there basketball careers. Latest stop; Dutch Broadway Elementary School. July 20-21, The 94th N Maple staff continued it's education though the USA Basketball Coaches Academy. The Academy was held in Mount Vernon New York, where coaches from around the United States like Mens Division 1 Coach King Rice of Monmouth University (Pictured here) came to teach on topics like Developing individual skills, Practice design, and developing Youth through Basketball. The New Nassau Coliseum opened it's doors this past week where the 94th staff Christened the new coliseum floor with the coliseums 1st ever clinic. As The Long Island Nets continue it's tour; the kids of Freeport Long Island came out and rocked the house. Feb.25th the 94th Academy hosted the NBA D-League Long Island Nets Basketball Clinic. Over 65 kids participated in the patented 94th challenge where kids ranging from 6-14 worked hard and learned from some of the best on Long Island. 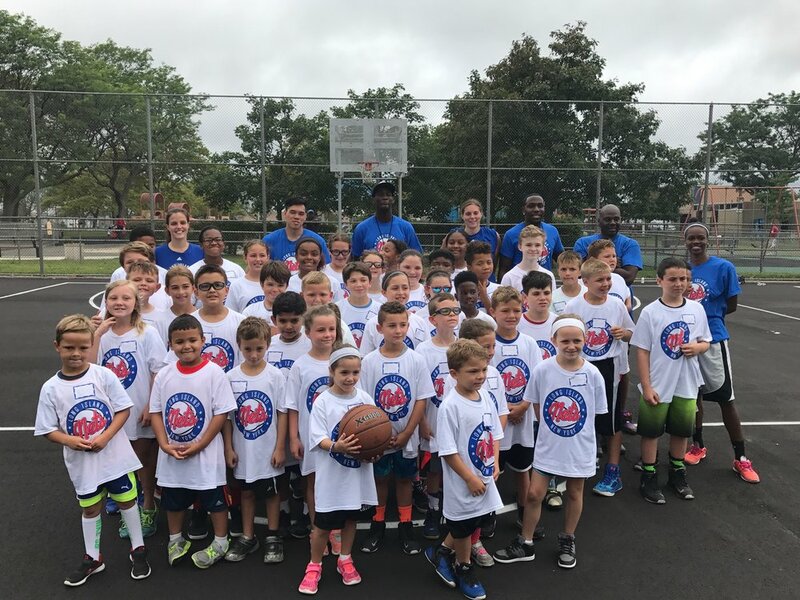 The 94th N Maple Basketball Academy hosted it's 1st annual basketball weekend presented by New York Senator Elaine Philips, wrapped up on Sunday afternoon after an exciting and successful weekend. 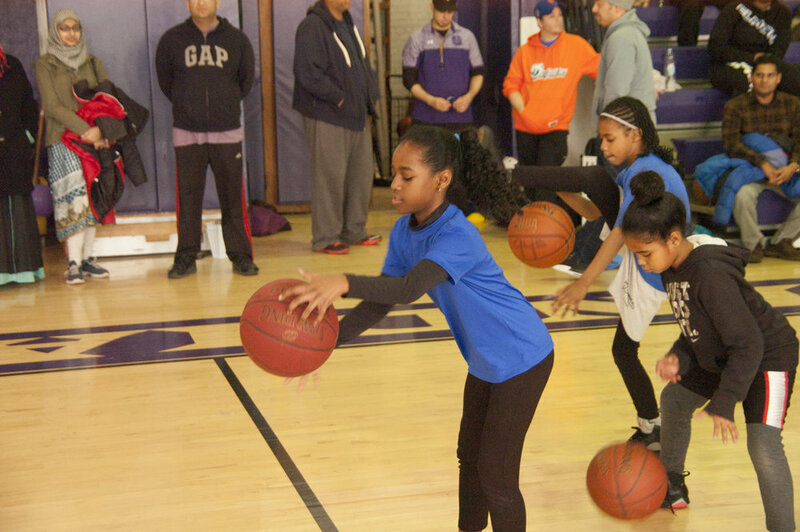 Approximately 150 local youth came out during the two-day weekend learning the game of basketball from the Sewanhaka and Elmont Varsity Boys and Girls Basketball Team, coaches and the 94th staff at Sewanhaka High School gymnasium. 94th Director Amaree Taylor receives Certificate of Recognition from New York Senator Elaine Philips who presented the basketball weekend. Pittsburgh Steelers Safety Jordan Dangerfield in the house! 94th Journalist Michael Fagan caught up with Dangerfield who grew up on long island. Jordan recently finished his season with steelers in a loss to the New England Patriots in the AFC. 12 spots, 49 athletes. The 94th coaching staff was in aw for the level of talent that was showcased at the 94th challenge. Long Island native John Petrocelli stopped in to show some love. Petrocelli an all conference Molloy Alumni now plays for the NBA Development League Erie BayHawks. Academy MVP Darius Celestin going the extra mile. Celestin showed up early to work on full court mechanics with academy director Demetrius Taylor. AAU Tournament is in the books! The 94th N Maple 12U AAU Basketball Club tryouts comes to an end. The 94th N Maple AAU Basketball Club has been approved by the Amateur Athletic Union. The 94th N Maple Coaching staff to assist in Long Island Nets Open Tryouts! The 94th N Maple Basketball Academy now NCAA Certified! 94th N Maple Athlete Hasan Ringer Accepts Full Athletic Scholarship to Queens College! Girls Rock! Kelly Dempsey to join the 94th staff as a Coach. When it Rains it Pours; Director Amaree Taylor lands Head Clinician with Nets. Fresh on the scene: Jarrick Bowe named Point Guard Coach. 94th N Maple welcomes Khalil McDonald as Head Coach. The Academy names Javel Welch of Roosevelt Long Island Head Coach. The 94th organization acquire Michael Fagan of St. Johns University. The 94th committee choses its instructor staff. The 94th N Maple Basketball Academy is a USA Basketball Certified Basketball Organization. USA Basketball prides its self on the GOLD STANDARD which was adapted by the 94th organization upon accreditation in June 2015. Creating an entirely new feel to your everyday athletic wear; designed to perform just as hard as you! The Last Shot follows American and Mexican basketball players whose careers have been derailed, as they compete in underground, cash-prize Mexican tournaments in search of one last opportunity to make a living playing the game they love. Come November, you'll know who worked all summer! After a workout, your body needs to "repair" itself to prepare for the next training session. It does so with the help of blood vessels that bring oxygen to your muscle tissue while removing waste products of exercise — the most common being lactic acid. Too much lactic acid build-up can cause your muscles to function poorly and will often lead to fatigue. Many people believe that resistance bands are ineffective when it comes to building muscle or toning the body. This belief cannot be more wrong and false. Studies have shown that the amount of force provided to stimulate the muscle fibers for growth is the same with resistance bands and free weights. You may have heard the term plant-based, but are you confused about what it really means? Is it the same thing as being a vegan or a vegetarian? Copyright ©2019 94th N. Maple. All Rights Reserved.